Seated Liberty Dimes with the Legend on the obverse of the coin were produced at the US Mint from 1860 to 1891. The main reason for the design change was that in 1838, stars were added to the obverse design. Due to the fact that the area of the coin that the stars occupied on the obverse, mirrored the same area on the reverse, where the legend was caused the coins not to strike up properly. Many silver dimes in this timeframe are poorly struck because of this, and it should be taken into account when grading. James Longacre's attempt to remedy the striking problem. He switched the legend from the reverse to the obverse and had Anthony C. Paquet redesign the wreath on the reverse. Unfortunately, in the end it didn't make to much difference. However, the design did last 32 years. 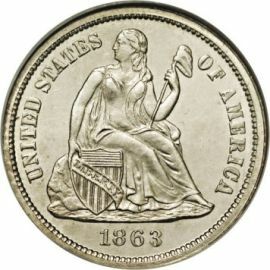 The front of the coin still shows liberty seated upon a rock, with the date below her. 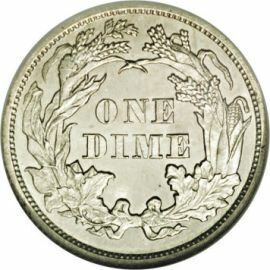 carries the denomination "ONE DIME"